Usually used when a job's prints are to be delivered in bulk to the school, this option does not prompt the customer for a delivery address. Note it is still possible to charge a postage fee with this option as the photographer may consider this a 'handling' fee. It is foreseen most people will use the new Delivery Options to define a "Delivery back to school" type option, and use that instead of the current "Delivery address not required" described here. This option is used when prints are to be shipped to the customer but no choices as to the delivery method are to be presented. The customer is prompted for a delivery address and a delivery fee is charged if set. For example the photographer may wish to offer local pickup from the studio for free, standard shipping for $10 and express shipping for $30. Furthermore the photographer may wish to have options presented (or not presented) depending on the delivery address of the customer. This is particularly relevant for international addresses where the photographer may wish the only option presented to be an "International" shipping rate while the same option should not be presented to local addresses. This became possible in Version 4.6 where the photographer can define 'Delivery option sets'. Each set can contain one or more 'options' giving the customer a choice of delivery methods at checkout. 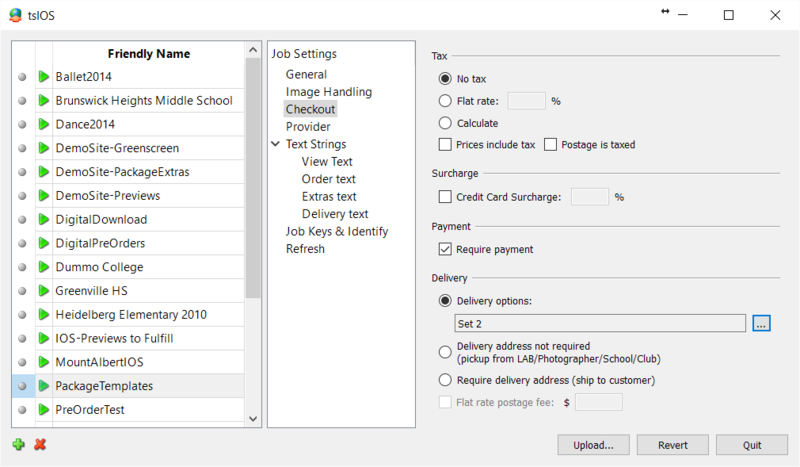 Delivery option sets are defined in tsAdministrator and selected in tsIOS when uploading a job. Sets are defined in the Delivery Options object of tsAdministrator as per the screen grab below. Starting a new set is simply a matter of giving the set a name then defining one or more options to the set. At a minimum the option should include the option code, description, whether a delivery address is required and a price. As per codes used elsewhere (seasons, offers etc) the delivery code is a short alpha numeric string to describe the delivery option. It is highly recommended the code be unique not only within a set but between sets as the code will be used in reports, headers and layouts to communicate the customer's chose delivery option. The code can be displayed on order headers with the @deliverycode tag. It is foreseen future updates will support this tag in other areas of the software such as pack layouts. Unlike the delivery code, the delivery description is a longer more literal representation of the delivery option. The delivery description is what is seen by the IOS customer at checkout and in confirmation emails. 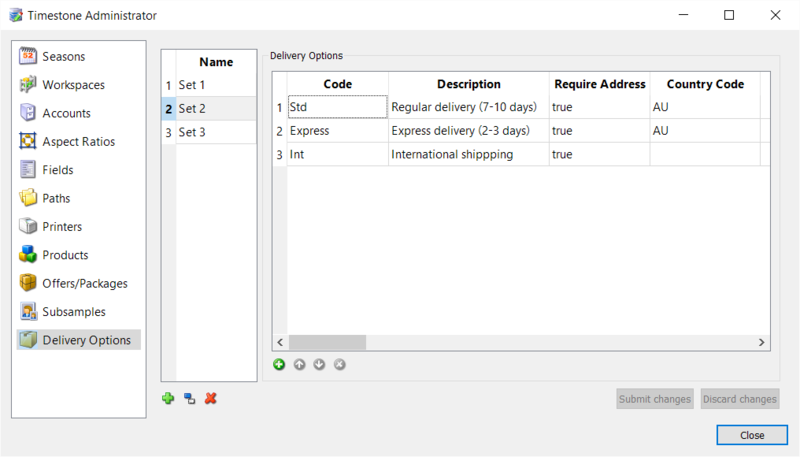 Each option needs to be flagged as to whether a shipping address is required for the option. Options marked as not requiring a delivery option (false) are always presented to the customer. Options requiring a delivery address may be presented or hidden depending on country and state codes (see below). As mentioned above there may be occasions where certain delivery options should either be presented or hidden depending on the location of the delivery address. The most obvious example is when a photographer wishes to offer an international shipping options or limit certain options to addresses in a certain country only. This is achieved by making use of the Country Code column. To restrict the delivery option to a particular country, enter the country's international country code. To display the delivery option to all shipping addresses regardless of country, leave the Country Code blank. 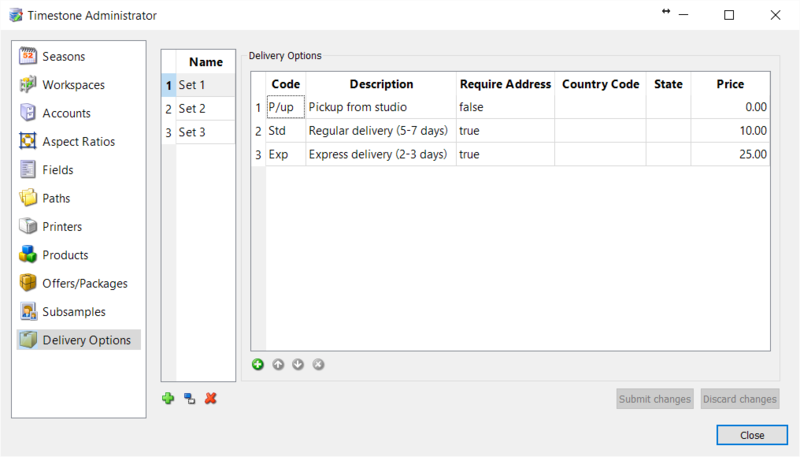 By defining a delivery option set containing options with and without country codes, the customer will be presented the delivery options most appropriate for their shipping address. In the delivery set shown below, two options use the AU country code (Australia). The third option is for international shipping and the country code is left blank. If the customer enters an Australian address, the first two delivery options are presented. For all other countries only the International shipping option is presented. At time of writing the state code is not currently used however it is foreseen a future upgrade will see state codes work in the same way as country codes. The shipping price is entered without a currency. The currency used is that set in the offer uploaded with the job.